These images were shared with me; I put together this montages and would like to share it with you. From over 20 candidates having declared their aspirations to be president and commander-in-chief, there are now only 5 main candidates still in the race, including Donald Trump. And, unsurprisingly, the candidates still in the race all are from or represent states that have in the past given the US its presidents. Was it wrong to drop the bomb on Japan? 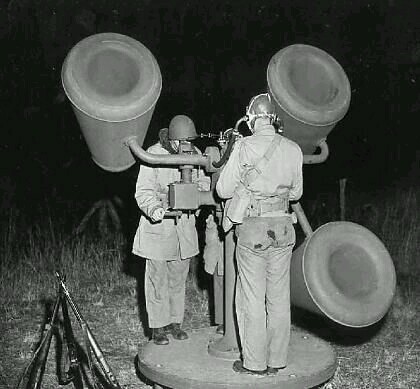 A US Army sound locator in use: 1943…..As a military air defense tool, passive acoustic location was used from mid-World War I to the early years of World War II to detect enemy aircraft by picking up the noise of their engines. It was rendered obsolete before and during World War II by the introduction of radar, which was far more effective (but interceptable). Acoustic techniques had the advantage that they could ‘see’ around corners and over hills, due to sound refraction.